Matter of State Div. of Human Rights on Complaint of Granelle, 70 N.Y.2d 100, 103, 510 N.E.2d 799 (1987). Here, Mr. Granelle was disqualified from employment as a NYPD Police Officer because of an asymptomatic back condition known as spondylolisthesis. The State Division of Human Rights found in his favor, but the Appellate Division dismissed his complaint. But the Court of Appeals reversed and held for Mr. Granelle. The Division conducted an investigation and had a hearing before an Administrative Law Judge. During the hearing Mr. Granelle testified about his employment history, which most consisted heavy lifting such as working in the construction industry, laborer, and truck driver. But he stated that he never had any back problems that interfered with his jobs. He also introduced evidence from his personal physician who testified that this condition if present in about 10% of the general population and that this condition would not limit Mr. Granelle. The City used the testimony of an appeals examiner that did not conduct an examination of Mr. Granelle but opined that there was a great likelihood of low back disability in the future but there was no reliable statics regarding this. Mr. Granelle was examined by an independent orthopedist who said he his strength was normal. When appealing an NYPD character disqualification what are the factors considered? Frequency of violations or infractions, such as arrests, moving violations or other incidents such as school discipline or work discipline. If you were suspended or expelled from school this would work against your NYPD Police Officer application. Also if you were late or disciplined at your job this would be a problem in your application. If you were terminated from one or more jobs without a good explanation this also would be something you would have to explain. Severity of violations or infractions. If you were arrested and charged with crimes that is, felonies or misdemeanors that would be something you would have to explain on appeal. If the disposition or final outcome of your case was dismissal or a lesser charge that could help you in your appeal. The recency of your last violation or infraction is also important your NYPD character appeal. If it has been a decade or even five years since your last infraction that could help you showing the New York City Civil Service Commission that you have changed your behavior for the better. The three categories do not stand alone- they are considered together in your appeal. If you have any questions about NYPD character appeals please call my office at (888)_998-9984 to discuss your case. Please visit my blog for further information. 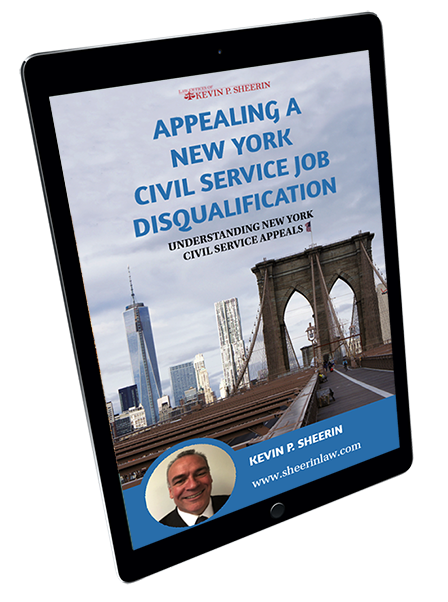 Civil Service Attorney for NYPD disqualifications.